As an award-winning podcaster, I help others launch and improve their own podcasts for sharing their passions and finding success. I create training resources (like SEO for Podcasters) and podcasting tools (like My Podcast Reviews); I offer one-on-one consulting and group training; I am a keynote speaker on podcasting and social media; and I host a network of award-nominated shows covering how to podcast, clean-comedy, and the #1 unofficial podcast for ABC's hit drama Once Upon a Time. I also write about entrepreneurship and technology. For years, I've prided myself on my accessibility. When someone emailed my podcasts or my businesses, I would personally read and respond to every message. It would sometimes take weeks or months for me to respond, but I refused to let someone else do it for me. I wanted to keep my hands in every aspect of my business—even in the design and coding of projects. I was the superhero of my business. Even though I knew that business style can't scale, I held on tightly. I considered it a badge of honor for me to directly serve my audience and customers, and to be skilled enough to design and code well. But the truth is that badge and my pride were getting in the way, weighing me down, and thus actually preventing me from serving as many people. Even those I could serve were often not getting my best. Growth is what all podcasts and businesses want, but it's also the hardest thing to handle. Growth requires more financial investment, better planning and communication, andmore trust in others. With properly guided growth comes higher returns, a stronger team, and greater outreach. This will be a hard transition for me. Many of these things will take longer for me to train than to do myself. That's only a short-term problem with long-term gain. Most importantly, this will allow me to better serve more people because I won't be so burdened with the details. So if you email my podcast or my business, you may get a response from someone on my team and I may never read the message myself. I hate that I can't promise a personalized response from myself, but that's now an impossible promise to keep while providing for my family. I'm no longer only the entrepreneur, I'm the teamleader—the CEO. By focusing on the right things for me, I can serve you better and reach more people at the same time. Business-owners and content-creators need marketing, at least until that can be delegated to someone else. Scott Stratten's book, UnMarketing, is a concise reference for modern marketing as well as a challenge to overhyped ideas. I've seen Scott Stratten speak a couple times before and I greatly enjoy his style. He's straightforward, honest, and filled with insight. But he never takes himself too seriously and his presentations are always fun. Stratten's writing style is no different. It's both authoritative and entertaining. You'll get great marketing information as well as plenty of laughs, especially from the footnotes. 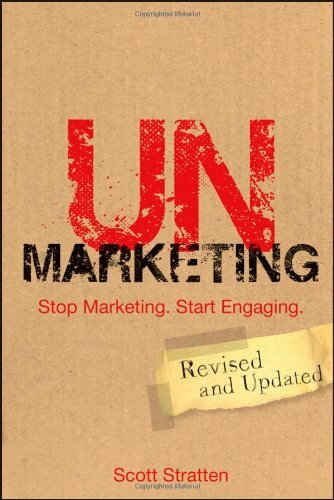 Of course, a book called “UnMarketing” would be a very different approach from most dry marketing books! While reading UnMarketing, I didn't highlight a lot of things Scott Stratten said, but I did find plenty of new inspiration and ideas I can apply in marketing my own business and content. Scott Stratten is good at representing common human feelings about marketing and customer service. With that understanding, he's able to present marketing ideas that will truly connect with other people. Some of the ideas seem so obvious that I would think, “Of course that would work!” But most of us have our heads so buried in our work that we miss these obvious opportunities to stand out. “UnMarketing” is the perfect title. It's like zombies who move like they're alive, but behave like they're dead. That's why we call them “undead.” Stratton's work is the same. It's about marketing, but it's about not marketing. It's really a book secretly about amazing customer service and relationships disguised as a book with “marketing” in the title. I read UnMarketing within a week and have plenty of ideas to last for years. My favorite chapters were “Hierarchy of Buying,” “Pull and Stay,” and especially “Viral Marketing.” These chapters do have highlights in my copy! Inside, you'll learn about engaging online and offline; in-person and over the Internet; and attending events and hosting your own events. I highly recommend UnMarketing, by Scott Stratten. I suggest you read it straight through, and then re-read the chapters that inspired you the most. Most of the chapters are short enough to read in only a few minutes. Scott clearly knew UnMarketing would be a great reference book, too, because he includes a helpful index in the back. This isn't the “SELL SELL SELL” kind of overhyped marketing. It's practical, effective, and engaging.Get your own copy of UnMarketing and tell me the biggest insights you gained! I'm sure you never have a stressful day, week, month or year. Everything you touch turns to gold, right? Isn't that what it's like for all smart people on the Internet? You know I'm joking! Podcasting, whether for business or hobby, can be stressful at times. And running a business, no matter its underlying passion, can also be stressful. So I'm doing something radical. I decided to take a kind of sabbatical. For the month of June, I'll be unavailable for consulting, interviews, answering questions, responding to feedback, or any other business. All requests will be automatically archived and may not receive any personalized responses. I will be available only to members of Podcasters' Society, and customer-support for my products will continue. If you need something from me, please contact me again after July 15. I will continue to publish episodes of The Audacity to Podcast, possibly some thoughts on this blog, and maybe some other content. This won't be a work-free sabbatical. During this time of reduced demands, I will focus on making Podcasters' Society even better, including new courses, resources, and other value exclusive to members of Podcasters' Society. Being transparent with you, I'm nervous about this. But I think the timing is right. Plus, while I was already considering this, I heard several podcast episodes confirming this is the right thing for me to do right now. I still have a lot of things going: several of my network's podcasts need your daily votes in the Podcast Awards, I'm preparing for Podcast Movement (as a speaker and a sponsor), The Audacity to Podcast was nominated for an Academy of Podcasters award, I'm re-opening Podcasters' Society on July 1. This is what I need to do, and I'm looking forward to it! 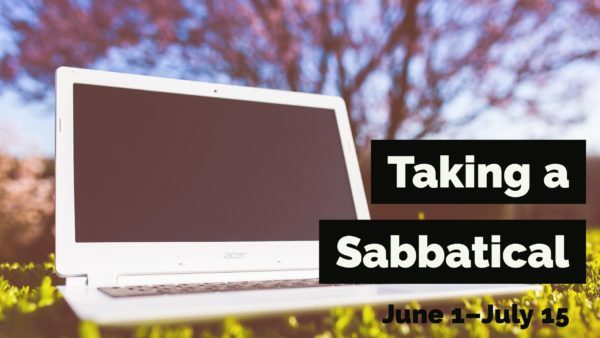 I encourage you to consider how you might be able to take your own sabbatical this year. When I sent this to my podcasting newsletter subscribers, I received wonderful cheers and encouragement. Even as I respond to consulting requests or halt business talks, everyone has been understanding and supportive! Here's to focus, clarity, and renewed energy!